When the weather starts to get warmer we love nothing better than getting outside. Whether its to the park or over at the grandparents spending time outdoors is our favourite place to be. We are hoping within the next 5 years ( hopefully sooner) we will live in a place with our own garden which means we will have to invest in some garden furniture. We will definitely checking out great garden furniture deals with Groupon. One of the main things is that what we buy would have to last us for the years to come. The last thing we would want would be to have to keep replacing items. Below is a handy guide on how to pick the right garden furniture for you this summer. For example do you enjoy dining alfresco? If so than a lovely comfy dining set on the patio would be ideal. Or if you are more of a relaxing and reading a book person than a lounger would be a better option. 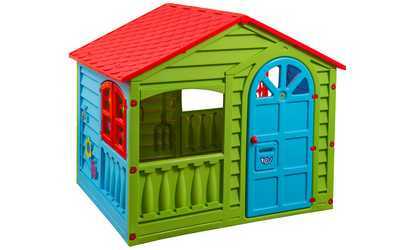 You may want to factor in if you have children if you want to purchase some fun furniture for them such as a playhouse. 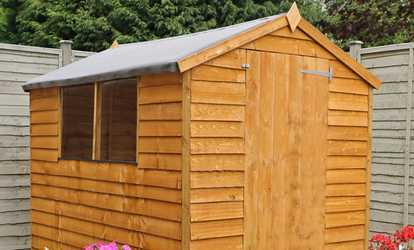 You may also need to consider if you will need storage and if a garden shed or garden box is the better option. When it comes to purchasing garden furniture a good idea to focus on the material for example with dining sets rattan and hardwood are great robust materials which will still need protecting during the winter months. Space is definitely important for example if you have a small garden squeezing in a large dining set won't be making the most of your space effectively. You maybe better off going for a small set so you can enjoy the rest of your garden. You may also need to question if you have children do you want to use the garden as just a place for them? If the garden is small you may only be able to fit a smallish playhouse for them to enjoy. Having a budget up front is the best way when it comes to garden furniture Buying cheap isn't always the best option and high end doesn't always mean its going to be better. So Invest in good quality garden furniture sets for the best response, longevity and robustness. But be wary of buying too cheap. 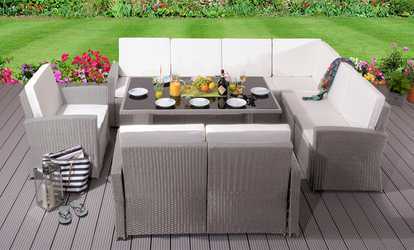 Garden furniture is an essential way for enjoying your garden and making the most of it. I would LOVE furniture like that when we get our own garden! We love our garden furniture, since we invested in it, its made us spend a lot more time in the garden. Next on our list is a shed! I really struggle with my garden sometimes! These are some great tips thanks for sharing! We bought a really nice dining patio set last year, quite similar to the one in your pic. I've been stating at it for months waiting for the sun to start shining again. I can't wait! We have been slowly adding to our garden furniture over the years - definitely something that should take time and research. We need a new shed - that is next on my list!